Suppose you're the captain of the varsity basketball team, like Troy Bolton, and your father is the coach. Or maybe you just happen to have a dad who is a really great sport. 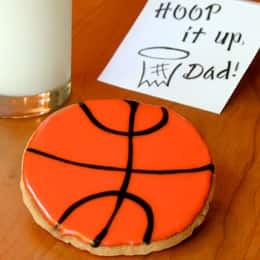 Either way, you're going to want to come up with a Father's Day surprise that's guaranteed to score -- and these jumbo basketball cookies are a slam dunk. *Keep in mind that the cookies will increase in size while baking. The ones shown here were cut from 1/4-inch-thick dough using a 2-inch-wide cookie cutter. They spread to about 3-1/2 inches while they were in the oven. Prepare the cookie icing by sifting the powdered sugar into a small mixing bowl and then stirring in 2 tablespoons of milk. Add the corn syrup and stir until the mixture is smooth. If it's too thick, add another tablespoon of milk. Put a few tablespoons of the icing in a small bowl and tint it black by stirring in equal amounts of blue, yellow, and red. Spoon the black icing into the pastry bag (or the small plastic bag, if that's what you're using). Stir red and yellow food coloring into the remaining icing, a little at a time, until you have the desired shade of basketball orange. Working with one cookie at a time, spread the top with orange icing. Then, before the icing sets, place the cookie on waxed paper and use the black icing to add basketball lines. Begin by piping 2 slightly curved lines that cross each other in the center of the cookie. Then add a U-shaped line to the top of the ball and an inverted U-shaped line at the bottom. You may want to practice piping lines on waxed paper a couple of times to get the hang of it before decorating the cookies. Set the cookies aside until the icing hardens.